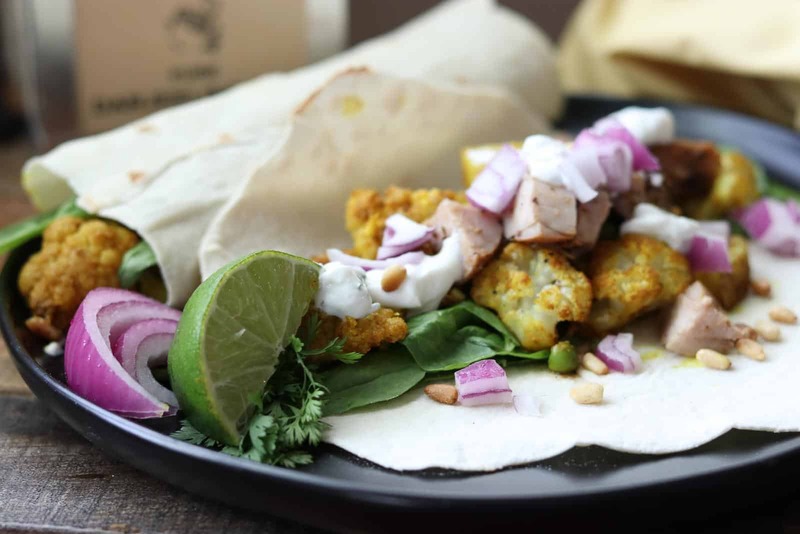 This Indian Chicken Cauliflower Wrap was inspired by my good friend Cheryl. She invited me over to her house this spring and served a fantastic lunch. Everything was amazing from her house, to the table setting to the delicious food! It was a fun afternoon! She told me later she wanted me to experiment with the wrap and create a recipe for the website, so I did! She knows how much I love to play around with food. You can serve this as a wrap or just eat the filling as a side dish or snack. I often just eat it as a snack without the tortilla and the chicken, just the vegetables it’s only 2 Freestyle Points per serving. It keeps in the refrigerator for about a week (without the chicken-5 days with chicken). Most people equate curry powder to Indian cooking. However that is not the case. While visiting India a few years ago, I couldn’t understand why the curries that I tasted, didn’t taste like, “curry powder.” When I asked, I discovered that curry powder is not really from India. Curry powder is made up of a bunch of different Indian spices, but it’s not from India. Here’s a more in depth article about the subject. And also this one. It’s fascinating! I came back from India with a ton of new spices and a new found love of Indian food. Can you use curry powder instead of the spices listed? In my friend Cheryl’s wrap, she used curry powder. You can definitely substitute curry powder for the spices I have used, it’s fabulous! Since curry powder has a distinct taste and not everyone likes curry powder, I have chosen to use other spices often found in curry powder in my Indian Chicken Cauliflower Wrap but if you don’t have those spices, then by all means, use curry powder. The McCormick Blend of curry powder is made up of: coriander, fenugreek, turmeric, cumin, black pepper, bay leaves, celery seed, nutmeg, cloves, onion, red pepper and ginger. For this recipe I have chosen to use only a few of those spices. Feel free to play around and add your own spices. 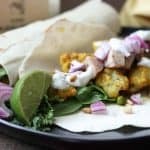 These Indian Chicken Cauliflower Wraps with their unique spice combination are fantastic with or without chicken. The filling also makes a great side dish or snack. But don’t forget the Cilantro Lime Cream, it makes the wrap complete! The cream adds a tangy cool taste to the contrast of the spiced cauliflower and chicken. 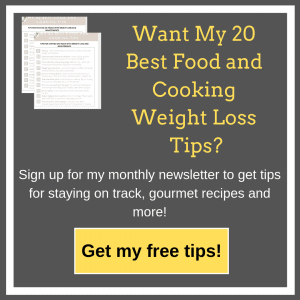 In a small bowl or glass measuring cup, combine oil, turmeric, cumin, coriander, salt, minced garlic, ginger, and cayenne. Stir well. 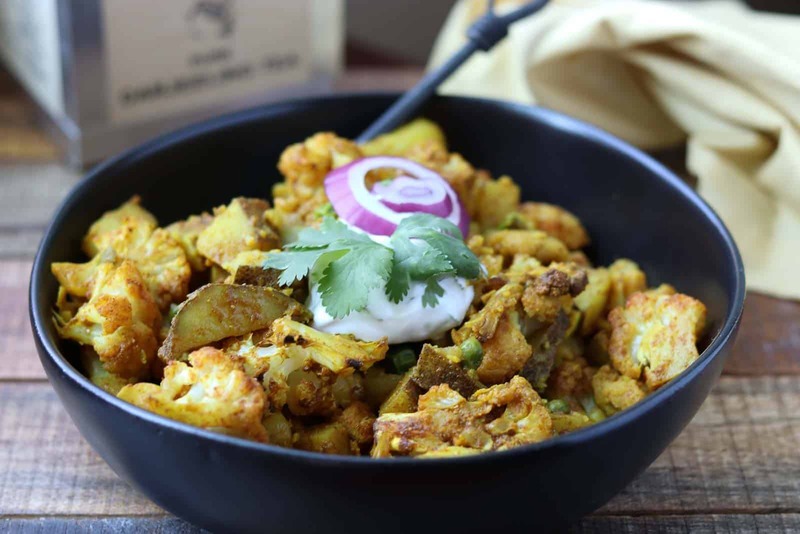 In a large bowl, combine: cauliflower, jalapeno, potato, and peas. Add in oil mixture with spices and combine well so cauliflower is coated. Spoon mixture into a non stick 9 x 13 baking dish (or spray baking dish with oil). Bake for about 15 minutes, then stir. Bake for another 10 minutes or until potatoes are cooked through and tender. In a small bowl, combine: yogurt, cilantro and 1/2 freshly squeezed lime. Set aside. On a tortilla, place a handful of spinach, about 3/4 c. cauliflower mixture, 1 oz of cooked chicken, 1 T. red onion and 1 T. of yogurt mixture. Garnish with golden raisins and pine nuts if desired. Roll up into a wrap and serve hot or cold. For vegetarians, leave out the chicken, it tastes great without it! You can serve this in a wrap or just eat it as a side dish or snack. I often just eat it as a snack without the tortilla and the chicken, just the vegetables it’s only 2 Freestyle Points per serving. It keeps in the refrigerator for about a week (without the chicken-5 days with chicken). If you don’t have all of the spices listed, you can substitute 1 1/2 T. curry powder. If you already have my Tomatillo Salsa in the freezer, thaw it out and pour it over the wrap, it’s delicious! You can also substitute my Jalapeño Cream instead of the Cilantro Lime Cream. No Replies to "Indian Chicken Cauliflower Wrap with Cilantro Lime Cream"